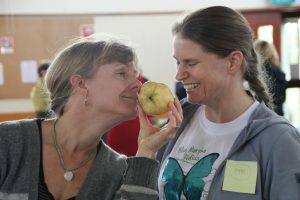 Franziska von Hünerbein writes about a movement that’s about sharing excess produce, community connection, and so much more. It all began with a tree, a big lemon tree full of bright juicy fruit. There it was, radiating beauty and offering abundance – unfortunately not to us, as it was growing in a neighbour’s garden down the road. I admired it from afar and was longing for lemons to cook my rhubarb jam with. One day I gathered all my courage, knocked on my neighbour’s door and asked politely whether they were planning to eat these hundreds of lemons by themselves or whether they would be happy to give us a few. He quickly got a box, filled it with fruits and swapped it for a jar of rhubarb jam. I have been a hedge peeker, a garden sneaker, a fruit stealer all my life. Spotting a tree full of fruits fills me with joy; seeing fruits rotting on the ground highly irritates me and brings up questions. When researching online I came across green swaps, vege swaps, food swaps and crop swaps all over the world. Names, logos and formats vary; the concept is the same. People meet, bring what they have, and exchange it for what they need. After a good read I knew we would do this! Let me take you to a Crop Swap Taranaki gathering. People carry full boxes and baskets into the community hall, sign in, find a free table and proudly display their goods. Neighbours and friends greet each other, walk around, admire produce, exchange gardening tips and welcome newcomers. Children run around, eye cupcakes and pet the ducklings. The whole room is buzzing with excitement and anticipation. 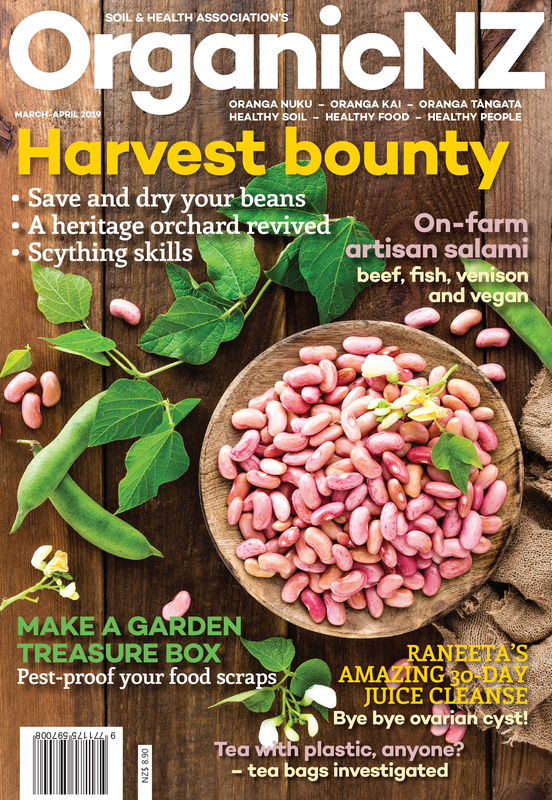 The variety on offer is huge: vegetables, fruits, plants, flowers, seedlings, herbs, eggs, preserves, jams, baking, liquid manure, gardening books, magazines, planting containers, sometimes even chooks who need a new home. After half an hour of admiration and connection time, the swap is opened with a brief introduction and everyone is welcome to take a fair share of what they are interested in. Everything is free. Baskets fill, tables clear and after a quick clean-up everyone leaves with fresh local produce and a big smile. Where does this immense joy come from, that floods everyone who enters the Crop Swap temple? Is it really just about swapping local produce to fill our stomachs? Crop Swap gatherings seem to meet many profound human needs. Connection is a biggie. For some people it is the social highlight of their week. They meet neighbours and friends, learn from the elders, hold a baby, are seen, are greeted, are hugged. We all have a need to be of service, to give and be recognised for that. The joy of generosity shows in the immense effort that some put into preparation and presentation: jars are labelled, fruits polished, muffins beautifully decorated, bunches of flowers bring colour to the tables. Most Crop Swappers are keen gardeners. Having our hands in the soil, witnessing growth, experiencing the seasons, observing and caring for all the expressions of life around us gives us peace and a sense of belonging. Sharing the fruits of this work with others is the cherry on top. Crop Swap gatherings have potential beyond the generous sharing of food. So far we have had mini workshops on seed sowing, organic gardening, sourdough bread making, food fermentation and the benefits of raw milk. Crop Swap Taranaki is connected to the food bank, the seed bank, the time bank, the environment centre Hive, and to our future community café. Imagine the possibilities of cooperation! Since the first Crop Swap gathering in New Plymouth our movement is constantly growing. We have three venues around Mount Taranaki (see box below), and there are more to come. Ideally we will have a Crop Swap Hub in every suburb and village of New Zealand, or, let’s say, the world. Creating one is easy. All you need is a venue and the people. In Taranaki we use a community hall, a church hall and a café as venues. Costs are covered by gold coin donations. We communicate via our local newspaper, school newsletters, email lists and our Facebook page. On Saturday 5 September we celebrated Crop Swap Taranaki’s 2nd birthday. And while we shared a huge birthday cake, we also celebrated being part of a paradigm shift, where giving with a mindset of abundance and taking with a mindset of fairness will lead into a future of collective wellbeing. Thank goodness it’s lemon season again. Franziska von Hünerbein lives with her family, a cat, chooks and a beehive in suburban New Plymouth, and is passionate about creating an abundant local food production in and for her community.